Surrounded by scenic beauty, the Roanoke region is a perfect destination for visitors wanting a little of everything in a Blue Ridge mountain getaway. Experience our railroad heritage, take in the arts and culture, shop, eat and enjoy the wealth of outdoor recreation in the heart of our breathtaking mountains. 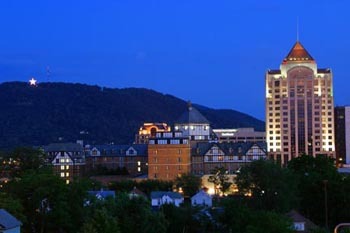 Roanoke's Center in the Square features the focal point of cultural activity with the Science Museum of Western Virginia and the Mill Mountain Theater. The Farmer's Market is also part of the Center in the Square. The area includes other attractions, such as the Virginia Museum of Transportation, the Harrison Museum of African American Culture and the Mill Mountain Zoo, atop Mill Mountain just outside the city limits of Roanoke. The famous Roanoke Star sits atop this mountain, reminding residents and visitors that "Roanoke" is called "the Star City of the South" and Indians named the Shenandoah Valley "daughter of the stars."